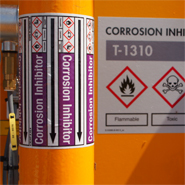 The main reason for marking pipes is to indicate the hazardous substances that are in them. In addition, non-hazardous substances such as utility systems (air, steam, water, etc.) may be marked in the same style. This second usage ensures that there will be no misunderstandings because of unmarked pipes. During operational and maintenance activities, pipe markings improve safety by providing a clear picture of the installed system. Blomsma Signs & Safety has many years of experience implementing pipe markings in the chemicals and petrochemicals industries and the offshore sector as well as heavy industry and wastewater purification plants. Our skilled workers can make their own determinations of what marking is required based on P&ID’s. We can also check the piping and installation diagrams (P&ID’s) supplied during the work, so that you have the current as-built information available immediately after completion. When pipe markings are placed, it is important that this is done at the proper position. Where a lot of pipes come together in complex pipe systems or manifolds, we place the markers ‘in line’. This provides an uncluttered and clear picture. We also make sure that the materials employed are appropriate for the application, the surface of the material and the required lifespan. Blomsma Signs & Safety uses high-quality products with a five-year 3M guarantee and with a dirt-repellent laminate that reduces UV and resists standard chemicals. There are quite a few factors that can cause quality issues with pipe markings. 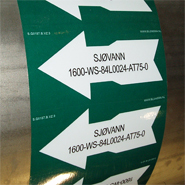 Factors that affect not only the quality of the labelling itself but also how the markings can affect your pipelines. 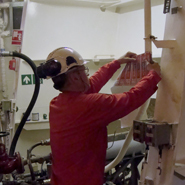 Working closely with 3M, Blomsma Signs & Safety has developed its own product line for marking and labelling pipes, PolyesPro® pipe markings. Download the PolyesPro® datasheet here. Our white paper, which was produced in collaboration with 3M, gives a description of the most commonly occurring problems and we also tell you how it can be done properly. Download the white paper ‘Pipeline marking: Quality aspects for reliable information transfer’ here. The Globally Harmonized System (GHS) is the uniform, worldwide system for the labelling of reservoirs and pipes that hold or transport chemical substances and mixtures based on their dangerous properties. The marking of pipes and tanks are obligated by law through international and national rules and regulations. 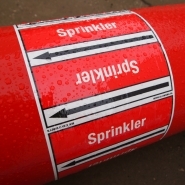 Our pipe marking contains the colour code for the medium, the flow direction(s), the correct GHS hazard symbols and a text describing the medium which is readable from every position. This layout guarantees instant recognition of the medium and any associated hazards at a glance. By using high-quality materials and applying GHS symbols your pipe markings will also be future-proof. When marking pipes, we assess not only what is required by law but also what is desirable. Marking utility pipes as well, rather than only the pipes containing hazardous substances, will make things clearer and therefore provide a picture of the entire process. Because there are then no unmarked pipes, incidents are prevented as there is no longer any doubt whether pipes contain hazardous substances or not. After all, pressurized steam or air pipes present a risk too. Pipes are marked in accordance with ISO-14726, DIN2403, NORSOK L-004, NEN3050 or other national or international standards. From the Tank storage industry, among other industries, there are many questions about the usefulness of marking all pipeline systems. This is partly caused by a practical challenge; the tanks’ and pipes’ contents change on a regular basis. In practice, this continuous process means that operators are working daily to adjust markings on pipelines and tanks based on the product that is present at that time. In terms of work, this means that markings must be made or ordered, old markings removed and new ones applied. At terminals with a substantial pipeline network this means a lot of work, work that cannot be directly linked to the productivity and efficiency of the terminal. In terms of signage, this can cause the perception that there is an ‘overload’ of signs and markings. Legislation and regulations however, offer opportunities to give a pragmatic interpretation to the positioning of the pipe markings. In our 16-page white paper called ‘Pipe marking for pipeline systems containing regularly changing substances’ you can read all about the challenges and risks, legal requirements and standards and practical solutions. You can download our white paper “Pipe marking for pipeline systems containing regularly changing substances” here.